SMEs: X-on provide a dedicated fibre data connection for VoIP rather than ADSL. Enterprise: We consult with your IT specialists to ensure that existing connectivity and network topography are suitable. Softphones: We only recommend a softphone deployment for customers with IT resources for testing and control. Handsets: We support deep integration with the Yealink 'P' range of handsets and some Cisco handsets. When designing a network to handle VoIP traffic, consideration needs to take place as to how telephony may be impacted by other data traffic when some or all of the network path is shared. In a small to medium deployment, such as a branch or office with less than 100 extensions, typically X-on will provide a dedicated data connection for VoIP. Where available, we will use Fibre to the Cabinet (FTTC) or Fibre to the Premises (FTTP). In some cases, subject to survey, we may use other types of high quality ADSL technology such as Annex-M. Although no longer the problem that it once was, the use of economy ADSL circuits which are highly contended, or run over long lines from the local exchange, is the most likely reason for call quality problems (echo or crackling) caused by packet loss or delays. For this reason, X-on will not generally support VoIP over customer supplied ADSL connections unless boundaries of responsibility are well understood and documented. If you are in doubt, it is best to let us supply a dedicated connection. For larger installations, with existing fibre connections and well specified firewall and router connections, we can work with your IT specialists to ensure that the connectivity and network topography are suitable for VoIP. There may be issues to discuss regarding firewall settings, including ports for the media and adding layers of security to avoid phones being compromised. This will be discussed alongside security policies relating to encryption of SIP data. In either case, it is recommended to keep VoIP and other data traffic separate on the local network (LAN) where possible. This is typically by arranging separate physical connections on the cabling or virtual separation (VLANS). Although most modern networks are easily capable of handling VoIP traffic alongside data, separation will provide additional layers of security and protection from VoIP being affected by adverse network conditions, such as 'network storms' caused by misconfiguration. Typically handsets are provided with an 'in and out' Ethernet connector for quick insertion into an existing circuit without extra sockets, however for an enterprise deployment this method is advised to be a false economy, or at least will increase risk. When softphones are being used in place of physical handsets, there is no choice but to share the LAN. There are many installations that run satisfactorily with softphones, however it should not be assumed that a softphone will work on any PC or laptop without the potential for time consuming hiccups. Conflicts with hardware, other software in the environment and particularly security settings can cause a softphone to malfunction, often in an obscure and difficult to diagnose way. Successful implementations use rigidly tested and applied policies to the desktop environment coupled with router and firewall policies. These are often difficult to impose in a smaller company and, if in doubt, a physical handset is generally recommended. It is sometimes impossible for X-on to diagnose an issue on a network that contains components outside our control and this has the potential for frustration on both sides. We will only recommend a softphone deployment to customers with sufficient in-house IT resource to be able to test and control a PC and softphone environment and cannot support softphones at all on roaming devices, such as smart phones or laptops. Alternative solutions such as X-on SIMs are available for mobile users. Whereas most modern handsets support SIP standards that mean they work with X-on services, we prefer to have control over the handsets and will usually make a recommendation that we supply handsets at costs included in your rental package. We support deep integration with the Yealink 'P' range of handsets and certain Cisco handsets that give the user control over many hosted PBX and call distribution functions from the softkeys on these phones. Also we support centralised directories using the LDAP standard. 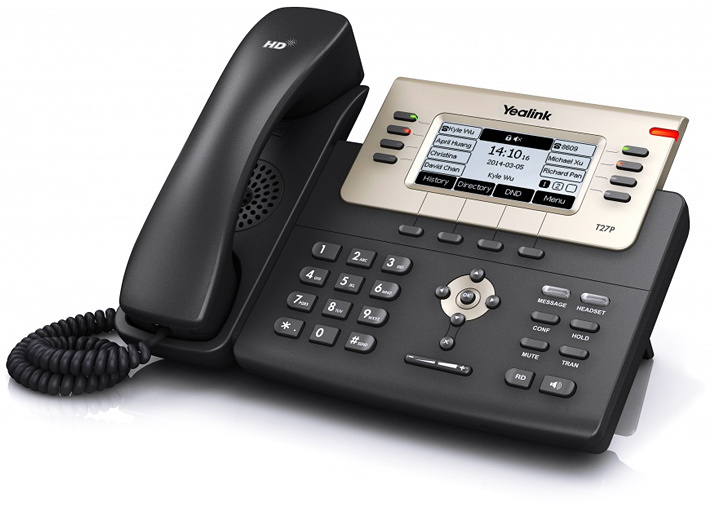 We have also tested encrypted SIP (SRTP and SIP over TLS) with the Yealink range. Although many other devices support SIP and LDAP, we cannot guarantee interoperability and can only agree to support these subject to a test process that we will discuss with you prior to engagement. If in doubt, let us provide the phones! For more information on VoIP Connection Requirements contact Sales on 0333 332 0000.